How a Santorini Sunset inspired a business idea. 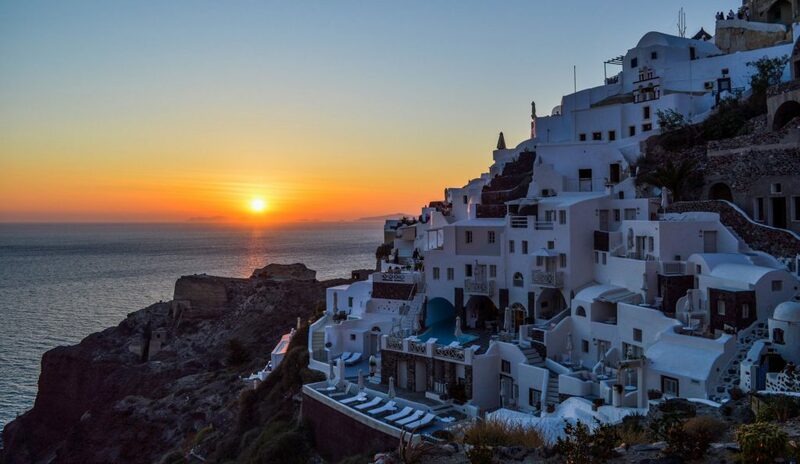 List 25 puts Santorini Greece at #5 for the top 25 sunsets in the world. A couple of weeks ago my wife and I got to experience this sunset for four nights. We felt pretty lucky. It truly was incredibly beautiful. Now, I’ll be honest. Living in West Michigan, growing up near Lake Michigan, I’ve seen a lot of great sunsets, so I didn’t think it was quite worth all the hype. But, it was very clear that in Santorini, the sun is a celebrity. Hundreds of people, 2 hours before the sun really got started setting, gathered in the small town of Oia, which is supposed to be the best place for viewing, for a front-row seat. Or should I say a spot in the crowded sidewalk? Yes, that’s what I’ll say. Rayanne and I didn’t have any interest in spectating the sunset in a shoulder to shoulder crowd or waiting 2 hours to see it, so we ventured off to find some cheap gyros, a beer, and see if we couldn’t find a better place to spectate. I was getting hangry, so I took care of that and we walked a little outside the city towards the setting sun. We found a little restaurant all by itself with a lot of empty space around it. It was clearly blocked off by some rope, but it was sitting there completely useless. We got a good position by the rope and camped out about 45 minutes before it started to get good. As we were standing there, more and more people started to get the same idea. The place we had found started getting crowded as well. My mind wanders if not stimulated with enough energizing activity so I pitched Rayanne my “business idea of the day” as she calls it. I saw the large empty space. I knew there were hundreds of people in this city for the night just to see the sun. (THE PROBLEM) There was no dedicated sunset viewing area to my knowledge, but there was great, unused real estate for it in this small, overcrowded village on the island. (THE SOLUTION) I thought, what if I rented that land, put out some chairs or a small section of stadium seating and charged people a small fee nightly to watch the sun? I couldn’t stop thinking about it, so here I am writing about it. Does that destroy the authenticity of enjoying the sunset? – I would argue the crowds do for me, so might as well embrace it. Is it profitable? Land in Santorini can’t be cheap. – I don’t know, I haven’t looked into it… yet. Can I validate this business? It just so happens, that this morning, the day of writing this, I saw on the local news station that a very popular beach in Grand Haven, MI, just started doing something similar with cabana rentals for $20 for the sunset hour (that’s only for two seats). Michigan, though I’d like to argue this, doesn’t even make the top 25 list referenced earlier and they are charging $20 sunset premiums for 2 seats on what is a perfectly fine beach for just sitting on to watch the sunset (Santorini doesn’t have nice beaches). At the end of the day, it’s all about who you’re watching a sunset with. That’s what makes a sunset so beautiful. What do you think? Do you like the business idea? Would you pay for a better, guaranteed good sun specatting spot? Comment below with your thoughts and feedback.